There have only been seven women to serve on the North Carolina Supreme Court in its 199-year history. In comparison, 92 men have served during that time. Closing the gender gap on the state’s highest court is a work in progress, but it was clear at an event Tuesday that the women who have already served are trailblazing a path for the future. The Supreme Court held a commemorative ceremony honoring its seven female members as part of a series of events for its upcoming 200th anniversary celebration. 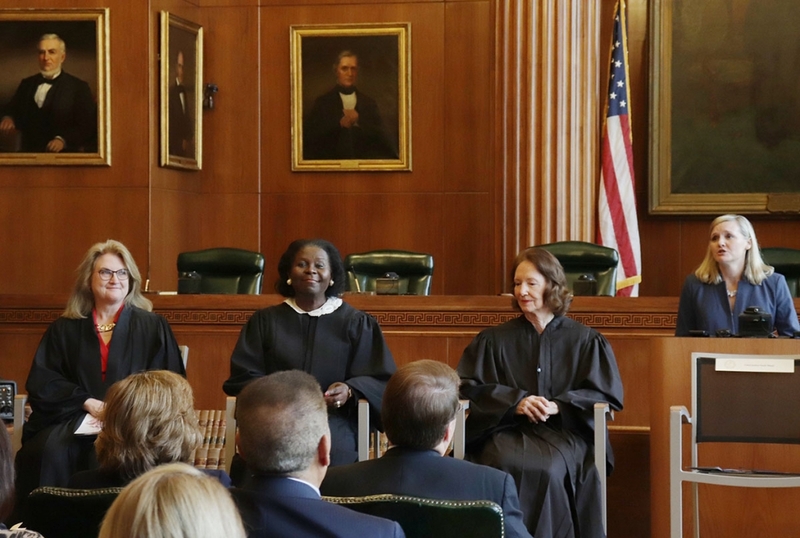 Guest speakers highlighted the careers and personal lives of the justices – six of whom were there donning their black robes; the seventh was recognized posthumously. Perseverance and the ability to juggle multiple roles in life – as jurists, mothers, partners, community members – were common threads that each woman shared. Denaa Griffin, a Raleigh attorney, told a story about current Justice Cheri Beasley in which an opponent in a campaign for a lower court seat once told Beasley that she would not have time to adequately do the job she sought because she was a mother of two toddlers. Beasley didn’t respond with anger, as Griffin said she might have expected. Beasley, like her female colleagues, has made it a point of emphasis to mentor young women, and particularly young women of color, on the challenges and joys of being a jurist and the importance of caring for and making time for others in one’s roles outside of that job. 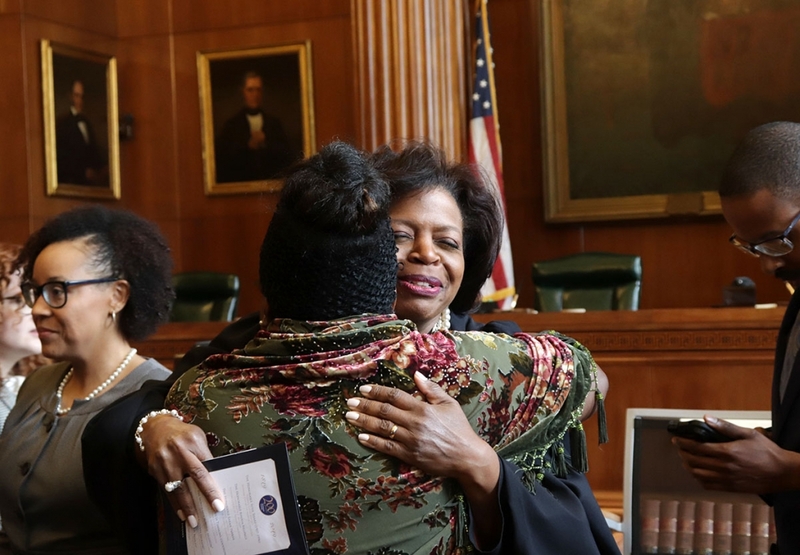 Supreme Court Justice Cheri Beasley hugs a friend at an event Tuesday celebrating women who serve and who have served on the state’s highest court. Griffin said it’s that kind of work that will help diversify the bench moving forward. Renee Crawford also told personal stories Tuesday about her mother, former Supreme Court Chief Justice Rhoda Billings, that helped to set that path in many ways. Billings’ story started in 1951 when she was told all freshman high school girls were required to take a home economics class. The principal agreed, and Billings became the only girl in her graduating class of 1955 who didn’t take home ec. She was also the only girl in her physics class. There were several memorable stories told at the event – the late former Chief Justice Susie Sharp addressing motherhood and being called “Miss judge” or “Madame judge;” former Chief Justice Sarah Parker’s unique efforts to maintain relationships beyond the court; Justice Barbara Jackson being considered the most technologically advanced justice on the current bench; and current Justice Robin Hudson’s rise to the court in spite of political attack ads that aired from New York to Los Angeles. 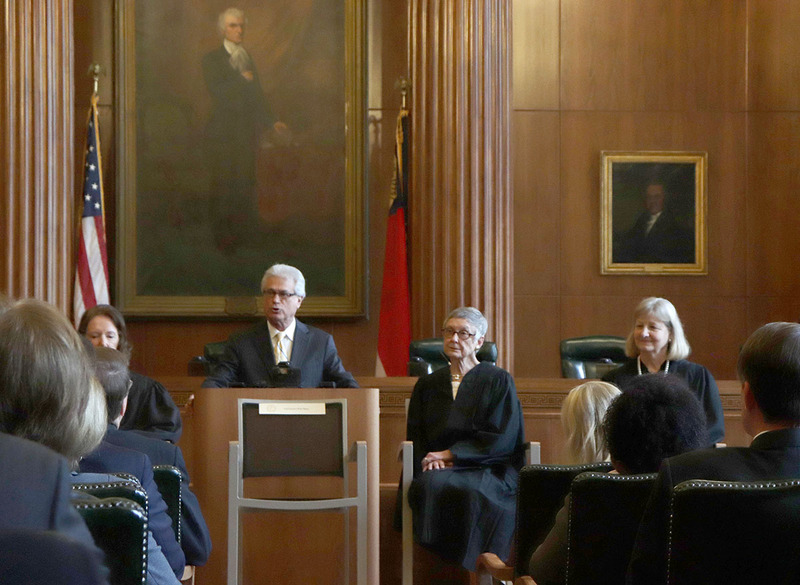 Former Supreme Court Justice Sarah Parker and current Supreme Court Justice Robin Hudson listen as attorney Franklin Freeman Jr. remembers the late Susie Sharp, North Carolina’s first female chief justice. 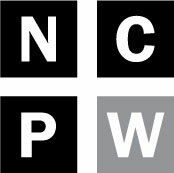 Jenny Leisten, who works for the federal public defender’s office in the Eastern District of North Carolina, introduced former Justice Patricia Timmons-Goodson. Leisten acknowledged separately that there is still work to be done on closing the gender gap at all levels of the state judiciary. She added that it was fitting that the women of the court were being honored on Equal Pay Day, which symbolizes how far into the year women must work to earn what men earned in the previous year. “As wonderful as this is, I do hope we recognize that we’re still working on things,” she said. The Administrative Office of the Courts released demographic data Wednesday which shows that women currently make up 34 percent of the state’s judiciary. Only 12 percent are of women of color. Hudson, who made closing remarks at the event, also indicated there was more to be done with respect to representation of women and minorities on the court.